In a medium saucepan, set over medium heat, pour in the water and sugar. Mix until the sugar dissolves. Add the sage leaves and when the syrup reaches a simmer, take the pan off the heat and allow the mixture to steep for 15-20 minutes. Remove the sage leaves and discard. Pour the sage syrup into a 8 x 8 baking dish, along with the blood orange juice, and mix. Transfer to the freezer for an hour. Remove from the freezer, and using a fork, lightly scrape the ice crystals. Return to the freezer and repeat the scraping every 30 minutes for 3 to 4 hours. Repeat the occasional scrapping until the entire mixture is shaved. To make the whipped cream, add all of the ingredients to a bowl and using a hand-mixer, beat until the cream forms soft peaks, about 2 to 3 minutes. 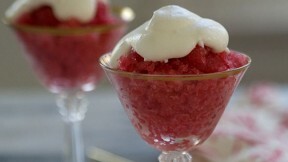 Divide the fluffy blood orange granita flakes between dessert cups and garnish with whipped cream, if desired.